News Archives - Page 2 of 2 - Allens Performance Ltd. Allens Performance Ltd. 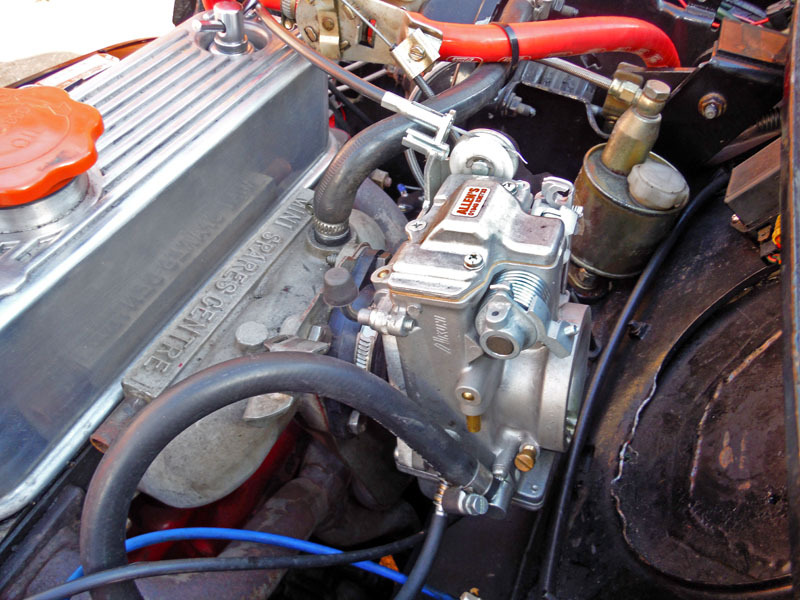 Although the five valve Yamaha engine is a great power unit with many applications, the standard carbs can give rise to serious limitations on a modified machine. Getting aftermarket carbs has been a problem in the past because of the different bore size of each carb. This kit resolves that issue. 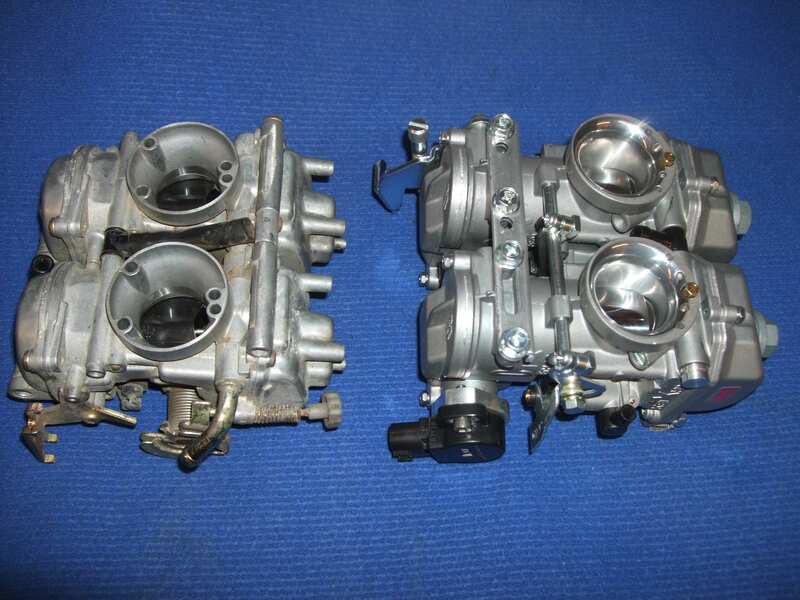 The photo below shows a pari of carbs spaced at 120mm. Obviously on the SZR/XTZ set, spacing is much tighter. Please ask us for details and pricing or phone 01949 836733. Fantastic! Finally it’s possible to get a close match for the reverse slide carburettors most sought after by TZ riders rather than put up with tired old orignals. Genuine Mikuni VM carbs modified and set up to suit. We can also supply slides only if you prefer, or even carbs fitted with conventional brass slides. Another specially built carb. Necessary because of the supply situation with Keihin Single CR carbs. This carb includes a sigot to suit a MkII style rubber and the clip on velocity stack with cover. 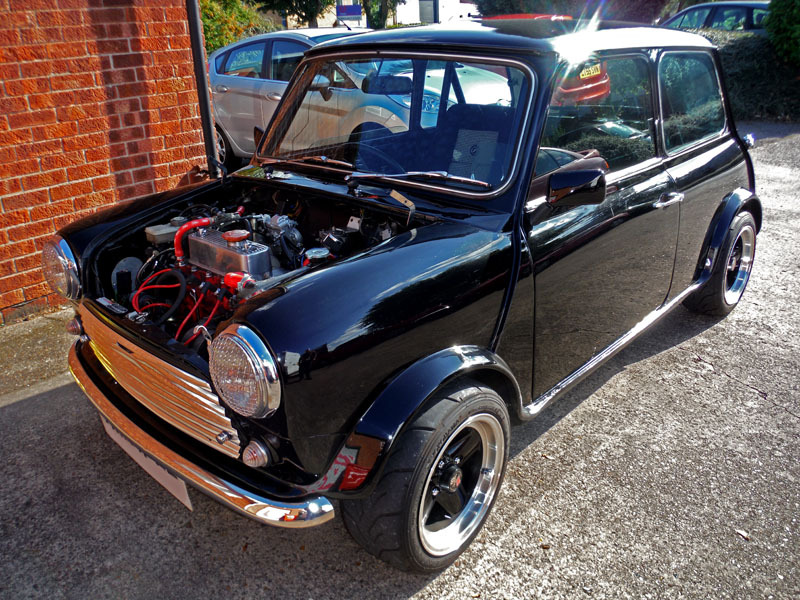 Our Carburettors don’t just end up on bikes, here’s a cracking little mini, much fettled and fitted with one of our Mikuni flat slide carbs! Apparently you can’t go far in this without getting the thumbs up. Shown here just after the a quick bit of setup. (As a slide type carb they are nice and simple to set.) 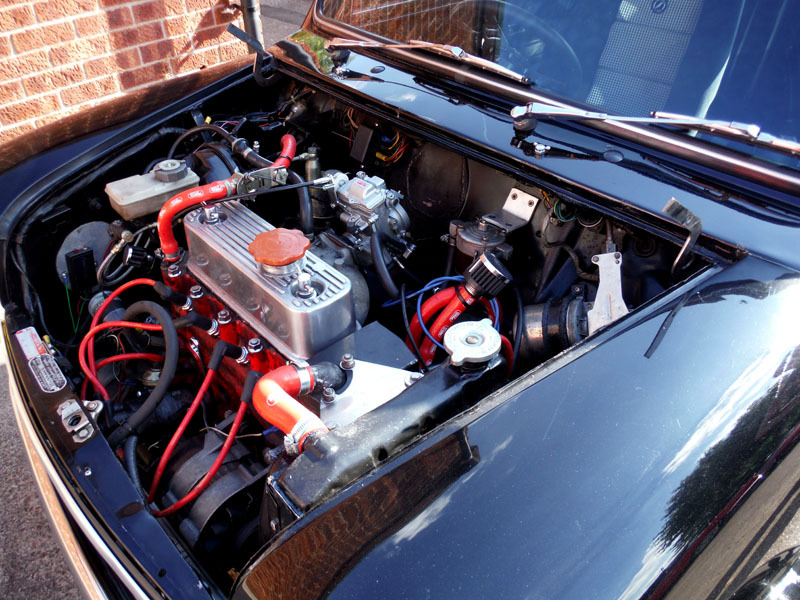 According to our customer it has transformed the car! Feast your eyes on the Mammoth Vee Twin of Doom! 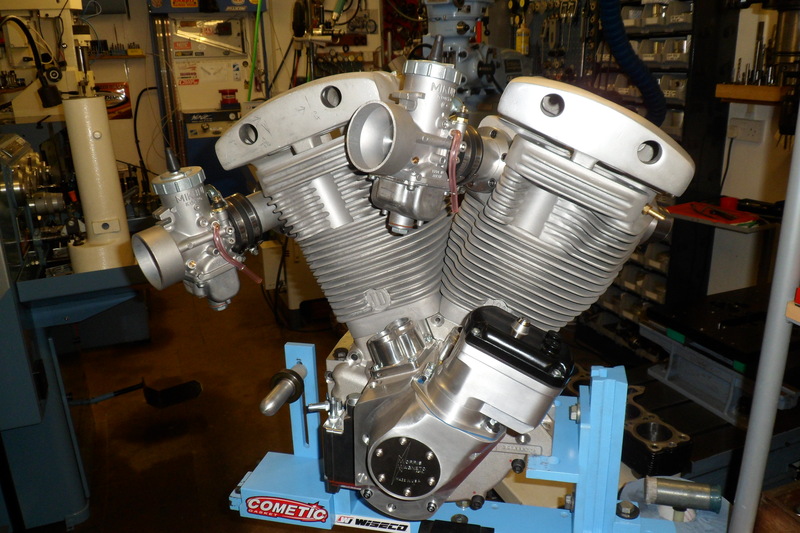 Here you can see a prototype for a run of extra special engines conceived and developed by the most eccentric Cylinder Head guru in the North, Jimmy Doom. The bore/stroke of 4.250″ x 4.250″ gives a total capacity of 120 cu in (around 2 litres.) 2.100″ valves are fed by VM44 carbs supplied by Allens Performance Ltd. Cam lift is 0.650″ and the exhaust headers are a full 2″ diameter. Doomsters are destined for a new wave of muscle bike so watch this space! These Keihin jet needles are given part numbers according to their dimensions. The syntax is N427-48-(TAPER)(L1)(DIAMETER)-(CLIP POSITION.) Eg: N427-48-DGH would be a taper of 1°45′, an L1 of 39.95mm and a diameter of 2.675mm. to make this event happen. The Classic Racing Motorcycle Club also got behind the idea and made it possible. 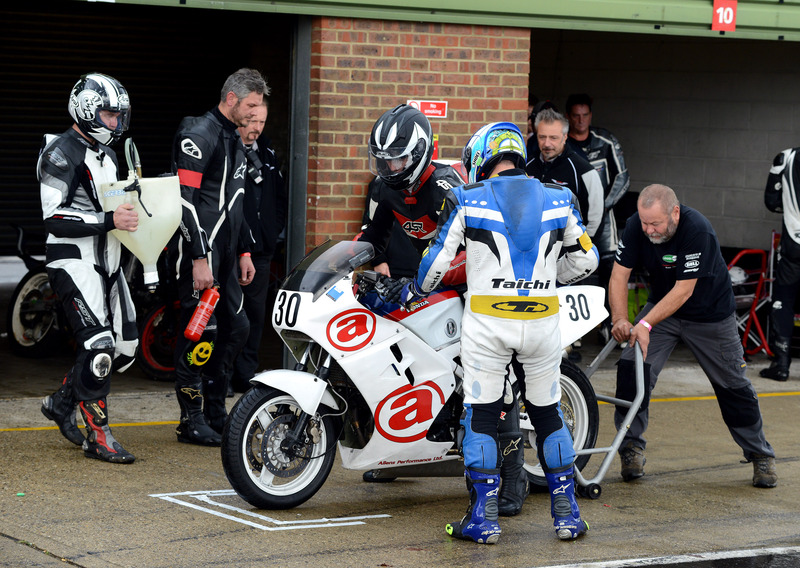 I’ve heard talk for years about the desire and concept to bring classic motorcycle endurance racing to the UK, but it still caught me by surprise when it actually happened! In order to give ourselves the best chance, I decided to find a nice, reliable (haha) Honda VFR750 and enter the F2 class. Although the bike was purchased early in the year, the various parts and work all came together very late in the day. 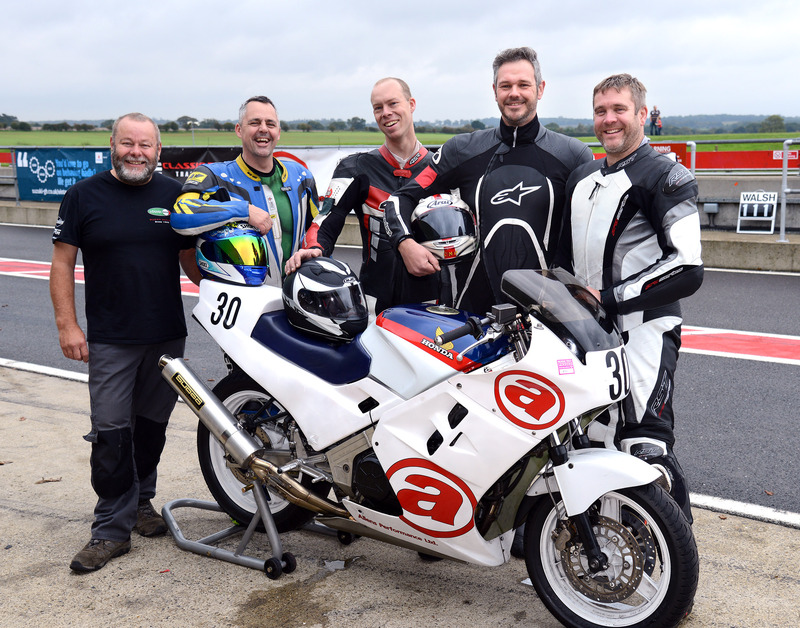 I tried the bike on the road months ago, but the practice on Saturday morning at Snetterton was the first time our VFR had ever actually taken to the track. Previously a 70,000, 3 owner non running bike bought for £400, it seemed very fit and willing. Dyno testing and a little rejetting of the carburettors further confirmed that it was producing 90hp at the rear wheel. Obviously 70,000 miles is enough to get these old Hondas nicely loosened up! Race preparation involved the usual service, removal of road specific pats, lockwiring of certain fasteners, swapping coolant for water, adding a race exhaust, rearsets race bodywork, Avon AM22/23 tyres, new pads, a new Nitron shock at the back, Hyperpro springs and S1 Suspension cartridge emulators in the forks. Conditions were fairly good for qualifying. We got 12th of 16. The carburettor setup was spot on. There were no glitches or flat spots, just seamless drive! Straight line speed wasn’t an issue but we all needed to gel with the untested bike. We reasoned that in a four hour race the starting position was not crucial in any case. Gear selection issues were our biggest problem but we managed to mitigate the issue before race day arrived. In the garage Alan Hudson had us all well organised, sorting out who was responsible for each task, keeping track of laps, lap times and even cooking a fried breakfast! 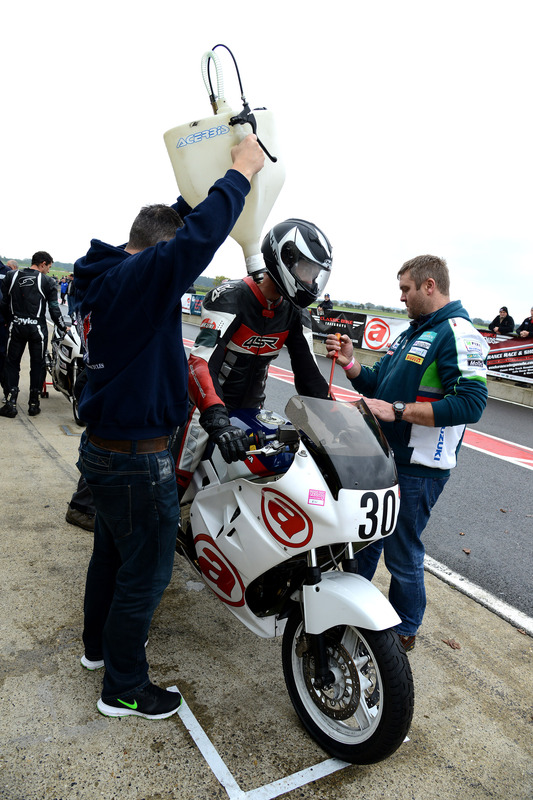 Nolan Freebury kept the bike topped up with fuel, wearing full leathers for fire protection and wielding the quick fill tank. (After Alan repaired it!) Nolan has since decided that he must get his Clubman’s licence in order to compete next year! The weather could have been a lot better! Words that spring to mind are damp, greasy wet, wetter and cold. A garnish of oil here and there too! 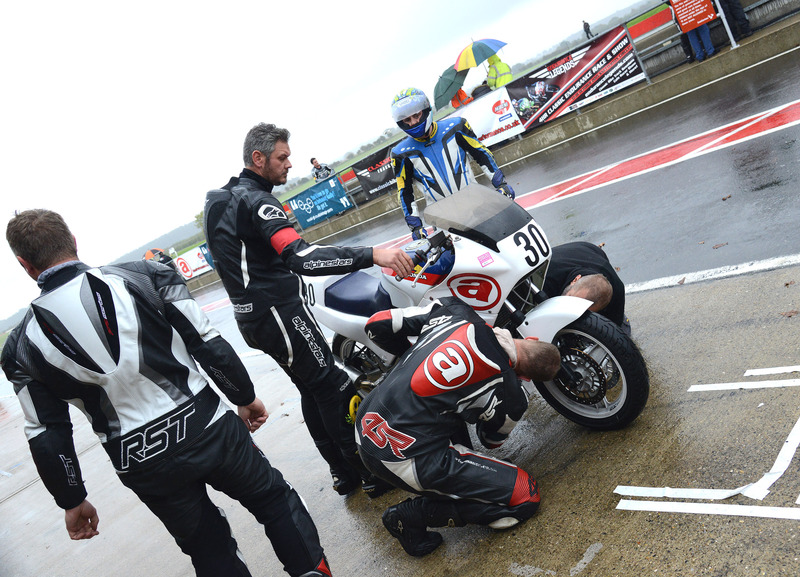 Since this event was run under the umbrella of the Classic Racing Motorcycle Club, wet tyres were not permitted! 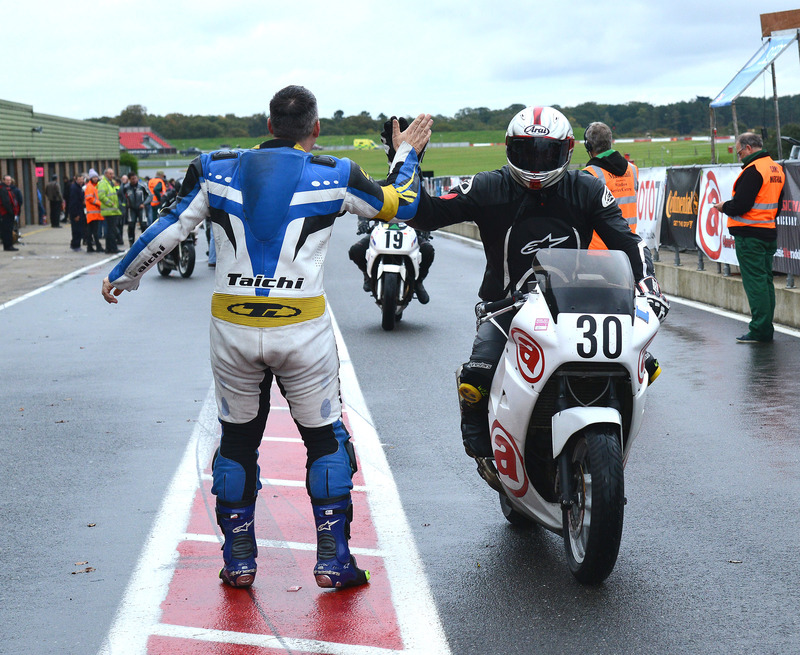 So, with caution I executed the start (running across the track to the bike was a novelty) and all seemed to go well. The track was wet but drying slowly. I was able to pass quite a few bikes on the first lap while feeling fairly safe about it. A few laps later, he track began to dry and I was able to push harder. However, arriving at the bomb hole amidst the wreckage of Phase One’s formula one bike did give me pause for thought! Just as it seemed that the track would get dry, the rain returned with a vengeance! I had eventually remembered to check for the pitboard and missed it the first time it was shown. It’s safe to say that visibility was not good! I did my first ever pit stop. I was careful to halt at the stop line and observe the pit lane speed limit. It was actually a relief to step off the bike and relax while the next rider, Chris Withey mounted up. I was flabbergasted when the guys told me that our team was running second in class! I was almost on cloud nine! I tried not to get too excited, a I knew there was plenty of time for things to go wrong. Unfortunately, soon after I began to clean my helmet it became apparent that Chris was having problems. 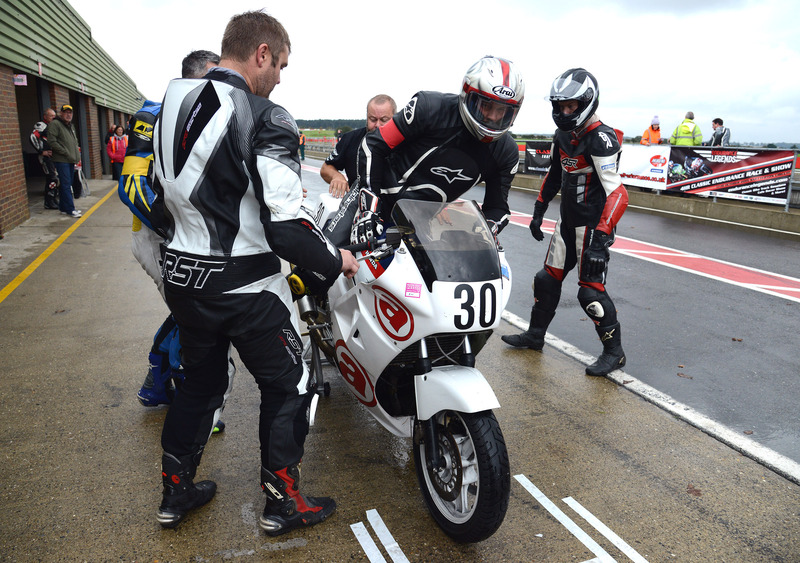 He’d broken down at Corrams and manfully pushed our big old VFR back to the pitlane in the rain. Our first suspicion was that the wet weather had caused us some ignition problems. We sprayed everything with a good deal of silicone, wrapped a few things in tape and the bike ran. Off he went again and stopped halfway up the pitlane. Another fiddle and the bike flew off while the rest of us bit our nails furrowed our brows. Chris and the VFR didn’t reappear for quite a while. Eventually they returned in the recovery van! Precious minutes were wasted while we tore bodywork off, checked and rechecked electrical parts, consulted wiring diagrams, pulled hair out, all to no avail! Eventually it was discovered that pulling the wiring loom around at the front of the bike caused the problem to disappear. We got it cable tied in an operational position and sent the bike out again. I was told that the drama cost us over twenty laps! Although the bike gave no further problems, the damage was done. Despite all three of us riding at a good pace considering conditions, it was impossible to catch the others teams except in cases where they had their own problems. The most dramatic event was a miscalculation of fuel load leading to an unfortunate splutter around Corrams before Chris made his stop. We worked out what had happened and refilled the bike! Brows were mopped after that pitstop. Drama and unwelcome ignition problems! Simon Hindley was our rider at the helm during the final leg of the race. Although the whole race had been run in challenging weather and we’d all had our share of scary moments, conditions were getting worse and worse with each lap. He did well to keep the bike off the ground and it seemed the closer he got to the flag, the more slippery and difficult the circuit got! 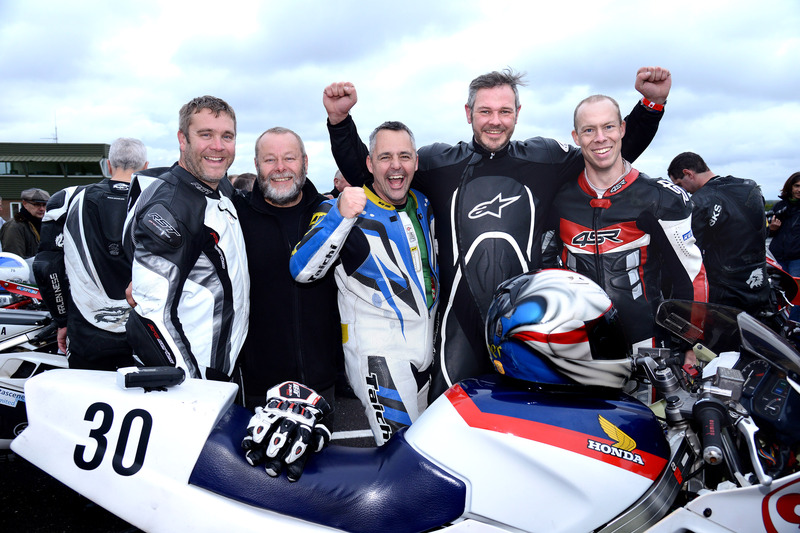 The whole team was overjoyed when Simon crossed that finishing line on the final lap! We’re successfully addicted. Next year we hope we can get a real result! Pictures by Claire Mackintosh, Clickers Photography Ltd. All rights reserved. Joy after Simon finishes the race! You will find most knowledgeable, long standing people in the motorcycle industry will already know about Allens Performance and its reputation. 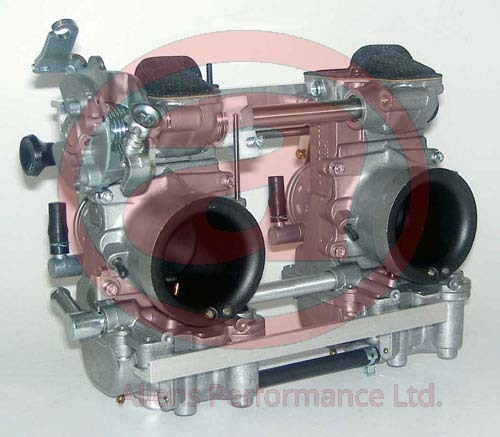 Anyone who has looked for long at a carburettor has probably marvelled at the complex appearance of these precision instruments intended to give you the perfect mixture of well atomised fuel in air despite the demands of varied load and speed conditions. Making all this happen is not a black art as some would have you believe. 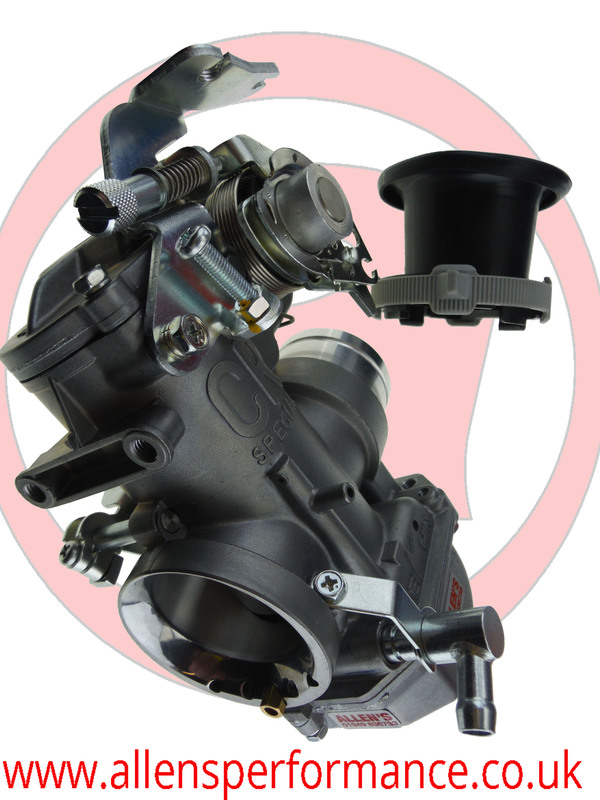 In essence, a carburettor is a simple collection of pipes, metering holes, fed by a pressure difference and a pool of fuel. However because there are so many unknown quantities involved it does require plenty understanding, logic, experimentation and experience to get things right. 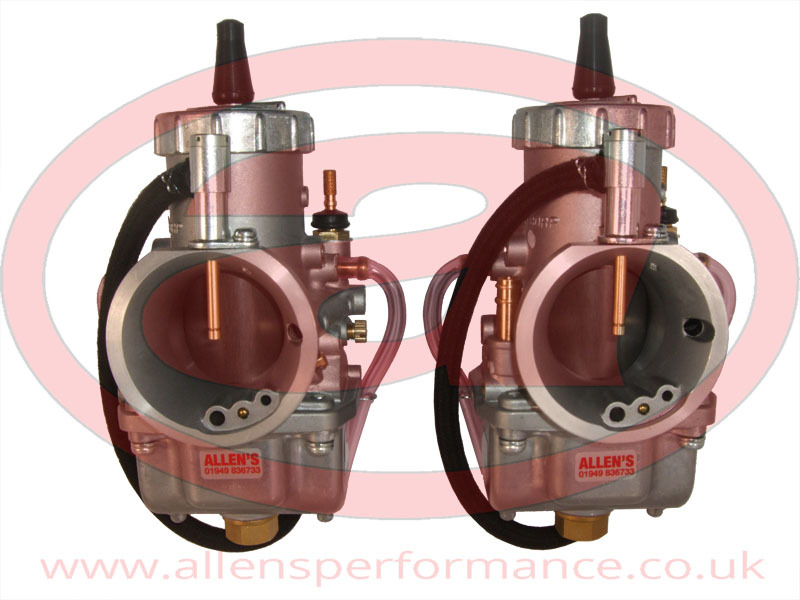 Allens Performance will help you achieve the perfect burn! Visit www.classicmechanics.com for more from this excellent publication.